Numbered days? : Zebra mussels totally cover a piece of underwater equipment from Lake Michigan.Courtesy M. McCormickFor more than 20 years, zebra mussels have gone unchecked in midwest waters. Introduced to North America as stow-away passengers on the bottoms of Great Lakes shipping vessels that came from Europe, the invasive species have exploded to fresh waters in 34 states at an alarming rate. But their days may be numbered. A New York-based researcher has discovered a bacterium that can kill zebra mussels (and also the related invasive species quagga mussels) without disrupting the rest of the food web. After rounds of lab testing, the Environmental Protection Agency has okayed the commercial production of Pseudomonas fluorescens strain CL145A, which can then be applied to waters and kill the menacing mussels. 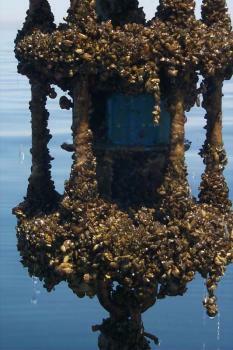 In lab tests, the bacterium killed over 90 percent of the the invasive mussels in came in contact with. Along with pushing out other species in the waters, the invasive mussels have also become a nuisance by clogging up intake pipes at water plants and attaching themselves to docks, piers and other submerged water equipment. Plans are still being developed on how to apply this new bacterium to the waters. All wise zebra mussels might want to start packing their bages and heading back to Europe before they find out what this new bacterium has in store for them! 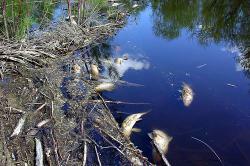 Invasive species in Minnesota lakes is an ongoing problem. But this story – an alligator shot by Minnesota game officials in a Scandia-area lake – may just take the cake. Oh, and they think there might be one or two more gators still in the lake. Game Play: "Nab the Aquatic Invader!" 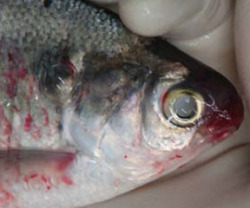 "the unusual species that create real problems in the Atlantic, Pacific, Gulf, and Great Lakes regions." Rules of play might be a little tricky for younger children, but the game comes with a guide for assisting teachers (or parents). Asian CarpCourtesy kate.gardiner ScienceBuzz is covering the danger Asian carp present to the Great Lakes. 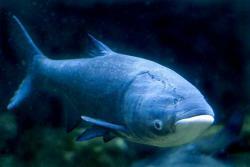 Last week a 19.6-pound, 34.6-inch bighead carp became entangled in a fishing net about six miles from Lake Michigan. 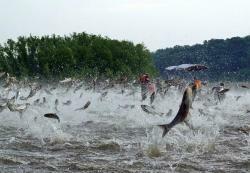 “Asian carp are like cockroaches; when you see one, you know it’s accompanied by many more you don’t see,” said Henry Henderson, of the Natural Resources Defense Council. 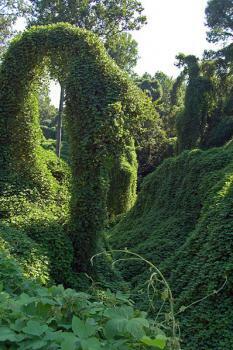 Kudzu: A kudzu infestation of a wooded area near Port Gibson, Mississippi. Note that the kudzu has completely overgrown several of the trees in this picture.Courtesy GsmithChances are good that if you're reading this post from North of Kentucky or West of Louisiana, you've never heard of kudzu. Down here in Charlotte and the rest of the Southeast, we're very, very familiar with this plant. Kudzu is an invasive species of vine indigenous to Japan and parts of China. As with many invasive species, kudzu was brought to America as a problem solver. Kudzu grows exceptionally fast, does a great job preventing erosion, and can be used as a feed for animals like goats and sheep. Humans can even eat kudzu flowers in the form of jelly. Unfortunately, the growth of Kudzu soon spun out of control. With no natural consumer or pest to keep population in check, the fast growing plant began to spread, strangling trees and entire fields of low lying plants in its way. Today, the entire Southeast United States is effected, with no real solution available. Well, a recent study by scientists from The Earth Institute at Columbia University just added another entry to the list of reasons to pull out the industrial sized weed-whacker: air pollution. Another reason kudzu was so sought after is its ability to take nitrogen from the air and introduce or "fix" it into the soil. There, microbes turn the nitrogen into fertilizer for other plants. Huge mats of kudzu are so good at fixing nitrogen that they're upsetting the chemical balance of the ecosystem, which in turn results in increased levels of hazardous ozone gas. Using the data they collected near areas of dense kudzu growth, the team of scientists were able to predict that in an extreme scenario, kudzu growth could contribute heavily to ozone warning days in the vicinity. For lots more information about kudzu infestation and control, check here. Minnesota state officials have announced that ash trees infested with Emerald Ash Borer(EAB) beetles have been found in Minneapolis. This destructive insect pest had already been confirmed in St.Paul in 2009, so officials were not surprised to find that it had spread. A quarantine has been in place for much of the past year, restricting the movement of ash in and out of Hennepin and Ramsey counties. Minnesota has one of the largest concentrations of ash trees in the United States, making it particularly vulnerable. You can see a map here that shows where in Minnesota the EAB has been found, and can read more about how to detect or prevent the spread of this tree-killing pest in ARTiFactor's earlier post. I’m not sure where to put this one. On the one hand, we’ve had a long discussion on the dangers of introducing non-native species into America’s wild habitats. That was about cheetahs; this is about jaguars; but the idea (a bad one) remains the same. OTOH, Bryan wants us to keep track of scientific decisions made by the administration, to make sure they hold to the pledge made in Obama’s inaugural address to base scientific decisions on scientific observation and data. This story could certainly go there as well. 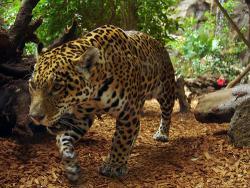 US Fish and Wildlife Service ignores scientists, takes initial steps toward introducing non-native jaguars into US.